In November 1988 LaFayette was given a retired caboose from Norfolk and Western Railway. The old rail car was meant to become a permanent exhibit or museum at the recreation department after being restored by crews from the local rail line, which had procured it for the city under the leadership of local railroader Randall Magnusson. That local line, now Chattooga & Chickamauga Railway, was then an operating unit (“Chattanooga Division”) of Southern Railway, itself owned by Norfolk Southern Corp. Norfolk Southern had formed almost a decade earlier when Norfolk Western bought Southern Railway in a wave of rail line consolidation that eventually shut down most of the trackage through Northwest Georgia. Norfolk Southern had a glut of extra or outdated equipment resulting from several mergers, and gladly gave LaFayette a retired caboose to commemorate the 100th anniversary of rails first being laid through the community. Cabooses are useless for modern rail operations but proved to be good public relations tools when given away to museums and parks all over the country. The Bank of LaFayette helped celebrate the car’s arrival in town by displaying railroad signs and artifacts in its West LaFayette branch, where most of them still are today. A train print donated by the railroad was also hung in LaFayette City Hall and has been in the council chamber next to a bust of the Marquis de Lafayette ever since. The Caboose came in with a Norfolk and Western Railway logo, but had spent most of its operational life rolling across the midwest and northeast as part of the New York, Chicago and St. Louis (NKP, or Nickel Plate) Railroad. It started out as NKP 778, then became NW 557778 before retiring to the sunny south. 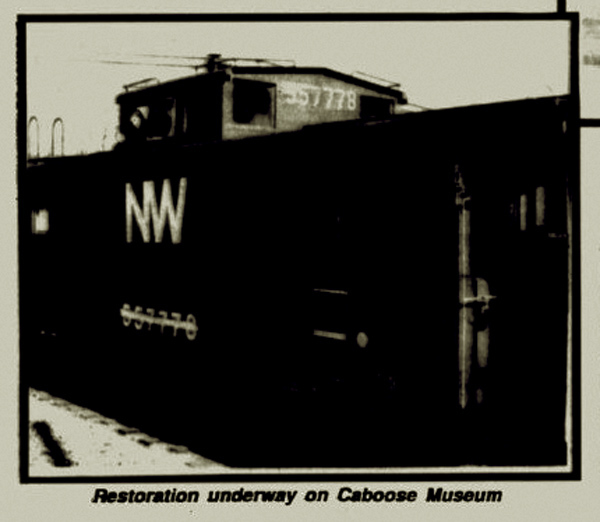 As shown above, cosmetic restoration of the caboose was finished – but somehow it never ended up on display at the rec. department or anywhere else in town. There are no other news articles about the caboose after February 1989 so it’s not clear if the railroad reversed its decision or if the city just never found an acceptable place to put the caboose and never took possession of it. The little caboose has been parked on the tracks in LaFayette a few times in recent years, but now primarily sits on rails further down the line next to Summerville’s Ingles grocery store. It’s likely either been given to Summerville to accessorize that city’s restored railroad depot and turntable or still belongs to the Chattooga & Chickamauga. Despite previous failures, LaFayette is trying to get back in the rail museum business with a donated baggage car. According to an August report in the Chattanooga Times Free Press, LaFayette’s Downtown Development Authority has talked the Tennessee Valley Railroad Museum into donating an old Central of Georgia baggage car to the city. The baggage car (which is apparently not related to two dilapidated passenger cars sitting near C&C’s W. Villanow Street office for the last few months) is currently being restored or stabilized by the rail museum with plans to eventually move it down to the Queen City for permanent display on a section of the old Fortune Mills/Sunrise Hosiery plant site. That mill (which was unique and a bigger factor in LaFayette history than other old buildings we’ve preserved) closed in 2004 and was abruptly demolished in 2009. A portion of the property was then donated to LaFayette and the rest turned into a used tractor lot. The donated .9 acre lot is in a flood-prone spot behind Shop-Rite and completely blocked in by other properties and a creek, overgrown, and often occupied by homeless polygamists. Downtown Development Authority leaders haven’t established a timeline for the project (which is already years in the making), but they hope to eventually clean up the property, set up a rail spur onto the lot, build an access road through warehouse property owned by the Ingram family, and turn the rail car into a tourist trap. Pulling all that off will be quite an accomplishment, and hopefully will work out better than the city’s last attempt with the caboose. For a city that would hardly exist without the railroad, LaFayette has done a poor job of maintaining its historic rail infrastructure. Summerville and Chickamauga both have restored their depots and have facilities in place for tourists riding historic steam trains from the TVRM to disembark. Currently the steam trains don’t even stop in LaFayette because there’s nowhere for passengers to get off, and if passengers did get off they would have little to see on the West side of town short of Queen City Cleaners, The Care Mission, and a pawn shop. The rail car might provide a reason for railfans to stop in Lafayette, but the lack of existing attractions or accommodations might well result in this latest rail car being parked in Chickamauga or next to the Caboose in Summerville. If you’re a railfan tired of waiting on the city to get this project moving, you might be satisfied in the meantime by the Tennessee Valley RR Museum resuming its steam-excursions from Chattanooga through LaFayette to Summerville. This year’s steam train visits (the first through LaFayette since 2008) will be every Saturday of October and November 5th and 6th. Excursions will pass through town on their way down and again on the way back up. Passengers can get off in Chickamauga and Summerville, but must begin and end trips at the museum in Chattanooga. An additional set of shorter trips from Summerville to LaFayette will be held on November the 19th with tickets available at Summerville City Hall. Photos: Walker Co Messenger, Railroad Picture Archives, Waymarking. Background Info: Wikipedia, Railroad Caboose List. If you know why the city never took possession of the caboose, we’d love to hear from you or read your comment. In order to continue the Friday Photo as a regular feature, we need your help with submissions of historical or newsworthy current photos. If you’ve got photos of local railroad history or anything else interesting from LaFayette’s past (or present) please e-mail it to photo@cityoflafayettega.com. Obviously it wasn’t stationary in 1990, and by then they had stopped calling it the Caboose Museum so that idea didn’t last long. 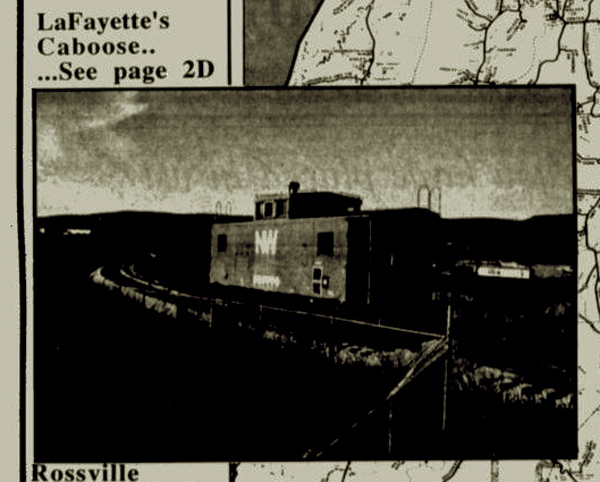 One of our observant Facebook participants has noted that there was, at one time, a stationary caboose parked on the West side of the LaFayette bypass between Stanfield Rd. and the old K-Mart site. That might possibly be this one, but it’s not likely considering how difficult it would be to take it off tracks and get it that far across town, and then for whatever reason bring it back. So we don’t know where the thing was between 1990 and 2003 when one of the above photos was taken. 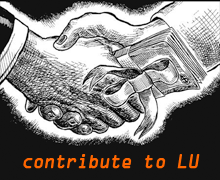 If you know, or have a thought, please let us know in comments or e-mail. saw the caboose this past weekend in summerville, ga sitting on the tracks for viewing. it was not being used. The mystery has been solved;. THE COUNCIL WAS ASKED IF THE CITY WANTS POSSESSION OF A VINTAGE RAILROAD CABOOSE. CHAMBER OF COMMERCE CHAIR LECIA EUBANKS SAID THE CABOOSE WAS DONATED BY NORFOLK-SOUTHERN RAILWAY TO THE LAFAYETTE AREA CHAMBER OF COMMERCE… WHICH HAS SINCE BEEN MERGED INTO THE WALKER COUNTY CHAMBER. 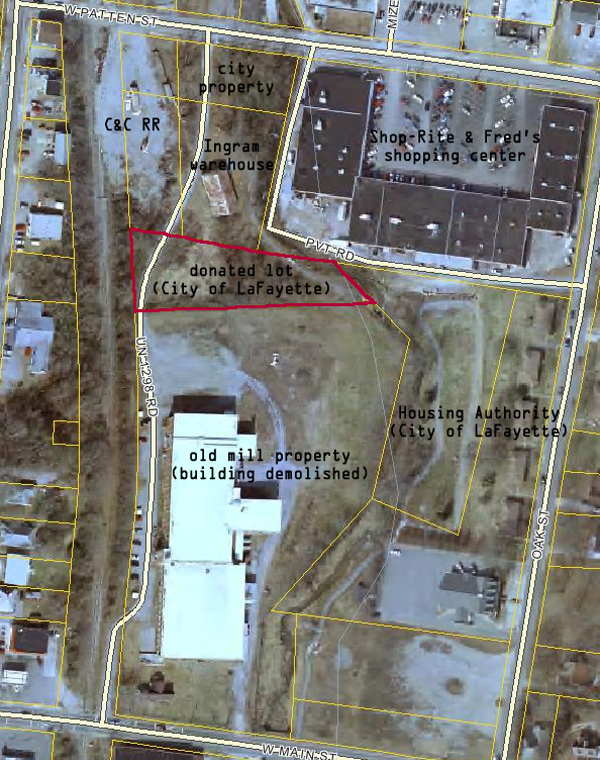 “THE CHAMBER WANTS TO GIVE THE CITY OF LAFAYETTE FIRST RIGHT OF REFUSAL ON THE CABOOSE”… EUBANKS TOLD THE COUNCIL. THE CABOOSE HAS BEEN PARKED ON THE C AND C RAIL LINE IN SUMMERVILLE FOR A NUMBER OF YEARS. “THAT’S BECAUSE THERE WAS NO ROOM TO PARK IT ON THE TRACKS IN LAFAYETTE”, EUBANKS SAID. THE CABOOSE ORIGINALLY BELONGED TO THE NORFOLK AND WESTERN RAILWAY… AND CAME TO LAFAYETTE PAINTED WITH THOSE MARKINGS. 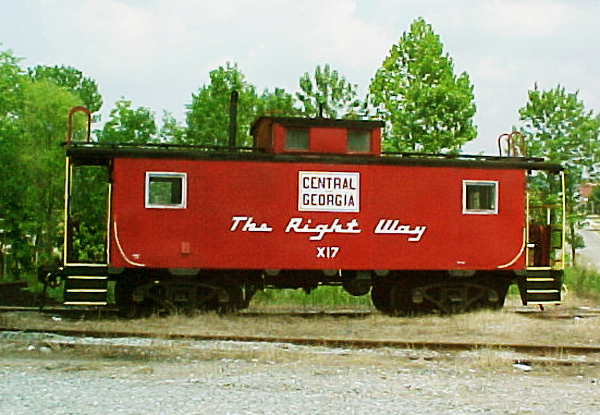 SINCE LAFAYETTE WAS SERVED BY THE CENTRAL OF GEORGIA RAILWAY FOR MOST OF THE 20th CENTURY… A GROUP OF TRAIN BUFFS REPAINTED THE CABOOSE WITH THE MARKINGS OF THAT RAIL LINE. THE COUNCIL WILL CONSIDER WHETHER TO ACCEPT THE CABOOSE… AND FIND IT A NEW HOME IN THE QUEEN CITY. THEY ALREADY HAVE A DONATED CENTRAL OF GEORGIA PASSENGER CAR FOR FUTURE DISPLAY. THAT CAME COURTESY OF THE TENNESSEE VALLEY RAILROAD MUSEUM IN CHATTANOOGA. 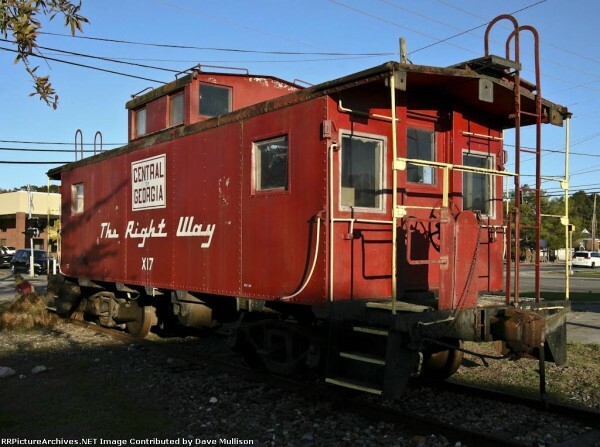 The caboose didn’t belong to the city, it belonged to the old LaFayette Chamber of Commerce. When the LaFayette chamber merged into the current Walker Co Chamber they totally forgot about it, and nobody thought about the thing for twenty years. Now we’ve run an article about it and all of a sudden they remember who owned it. Would it KILL these people to give us a little credit on occasion?